A Queensland truck driver caused a smelly situation this morning when he accidentally spilled an entire load of manure onto a Toowoomba highway. Police and road authorities were called to the corner of Boundary Street and Carrington Road, just west of the Toowoomba CBD, following reports a truck has lost its load at the intersection. Upon arrival, they found the undercarriage of the trailer and a large portion of the road covered in the fertiliser. 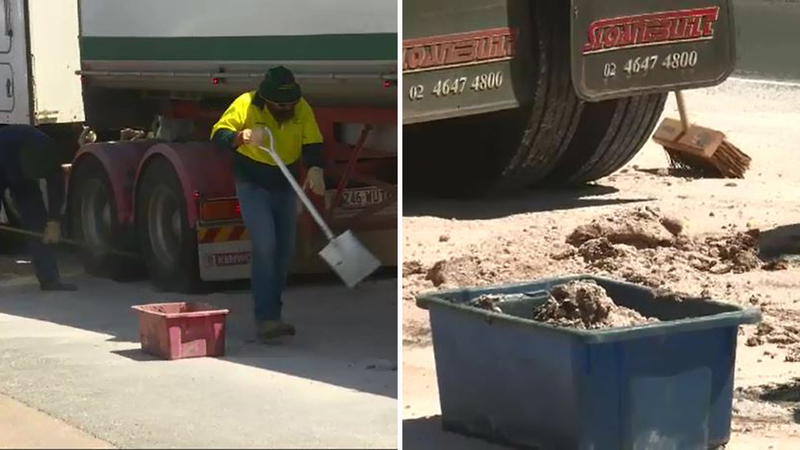 A Queensland truck driver sparked a very smelly situation in Toowoomba after spilling an entire load of manure. The driver had swerved to avoid a possible car crash on the corner of Boundary Street and Carrington Road when the load was spilled from the truck's trailer. Councillor Joe Ramia from the Toowoomba Regional Council told 9News the faecal matter had been accidentally dumped on the road after the driver managed to avoid a collision with another car. “A truck carrying manure, swerved to miss a vehicle on the corner of Boundary and Carrington Road, as its swerved to miss the vehicle the back gate must have come open and the load emptied out on the highway,” he said. “(A) very dicey situation I can say. The intersection was closed down temporarily while council workers tried to clean up the smelly mess. Local councillors have praised the workers for helping to deal with the faecal matter. The intersection was temporarily closed down and traffic affected as workers used shovels and brooms to sweep up the mess. “Hopefully the people doing it have on the protective gear and correct equipment to clean the mess up,” Cr Ramia said.